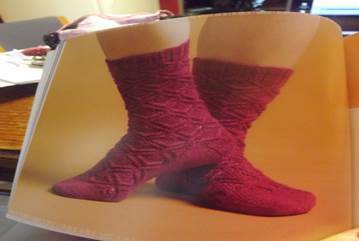 I am finally getting around to writing about Sock Innovation by Cookie A! I chose this book to review because of all the beautiful sock patterns in it. I thought that it would be a nice book with pretty patterns and some instruction but not a lot. However, that could not be further from the truth. Cookie A goes into a LOT of detail on how a sock is constructed, how heels are done, stretchy bind offs and how to accomplish that, the different types of textures that she uses in this book and how to create them, and THEN you get to the patterns themselves. The socks are beautiful! They are all done top down, and I prefer to do toe up because of how big my feet are. I like being able to try the sock on for fit as I go. I am not sure that I will do any of these patterns due to the fact that they are all top down, but being that I have yet to try a top down I may try it just to see if I like it as well. I have knitting friends who swear by doing socks from the top down, one at a time. I aspire to do 2 socks at a time, toe up, on one circular needle so that I don’t suffer from second sock syndrome. I get bored very easily, and I believe that if I have to do 2 socks on DPNs or a small circular needle that I may not ever get to the 2nd sock. How many of you suffer from this syndrome? Is it easy or difficult to get past? I know that the sock patterns in this book seem complicated when I first looked at them, but as I looked again and again they are just like all the rest of the knitting patterns I see. Knitting and purling in ways to create the texture that the author is going for with the design of a particular pattern. If you know how to knit and how to purl you can do anything, right? LOLOL! That’s my story, and I’m sticking to it! Can you see the texture in these socks? The picture didn’t import very well, and I have a lot of these types of pictures from the book. As I said above, she discusses basic sock construction, biases, designing, gussets, heel flaps, how to avoid the pesky holes in the gusset, and she has a lot of the stitches explained with pictures at the back of the book. I think this book will please sock enthusiasts as well as teach newbie sock knitters how to knit their first pair of socks. I believe it was well worth the money that I spent to buy this book, and I think it would be a good book to have in anyone’s knitterly library!